Time to discuss exactly what we think of Border Town Burning's list as it gets ready for release! If you haven't seen Vexxus' Warband, take a look. Also, check out some of the pics on the gallery on their web site. They posted this preview video today! Discuss what you like/dislike about the list! This post was last modified: 08-01-2008 10:47 AM by Xander. Bull Centaurs don't really seem to fit into this environment. You can't have everything from the actual army in a Mordheim warband, after all. 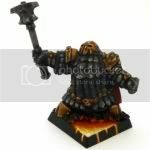 I'd prefer rules that used the Hero/Henchman divide to depict the way slavery works: all the Chaos Dwarfs should be Heroes, and all the Henchmen should be various types of Greenskin. It looks like an attempt has been made to avoid confusion by just making it "Dwarfs only", while still keeping slavery as the focus of the background, which is perhaps a tad schizophrenic. I really enjoyed the feel of this list, and I thought it remained true to many of the ideals we have for CD's here on the forums. As HB said in CD Radio this round, I like the "Black Dwarfs" name especially since they still call the henchman a Chaos Dwarf. I definitely got into this list, and I think the balancing seems on par with many of the other lists they have available for viewing. My only criticisms would be that quantity rather than quality seems to be important in gameplay, and as such when I went ahead and made up warband lists and toyed with numbers, I couldn't put the armour and such that I wanted, due to gold costs. I would have liked to see it a bit tighter race between the two strategies, but all in all I am really amazed by the professional manner that BTB has presented the warband. The idea for a prison wagon is great, and its unfortunate that I couldn't make one, especially before the AC2 deadline haha. Maybe in the future, who knows. I was impressed to the point where I would love to order, or have made, a complete Border Town Burning supplement bound book. I plan to make at least one more warband, it is just so hard to choose! I shall (time permitting) post up my Black Dwarfs warband blog soon! IS THERE no sound in that video or is it just me? This looks like the same list that was done from WolfArmory (?) when Mordheim first came out, with a couple of modifications. I've played the first list for years, and loved it. Vrakkar and Zhorvan were originally my CD warband captains. Thanks again for all the support! Of course the Black Dwarfs and CDO got a fair bit of representation.